In 2013 we introduced the Exhaustive Library of Bible People and the Authorized Version People Edition, which is a very powerful resource for learning and about searching for the people of the Bible. 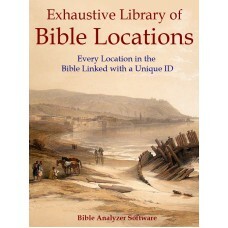 This year we are introducing the Exhaustive Library of Bible Locations with a newly updated edition of the AVp called the Authorized Version People & Places Edition. Not only does the AVp have all the people tagged with a unique ID, it now has all the places tagged as well! 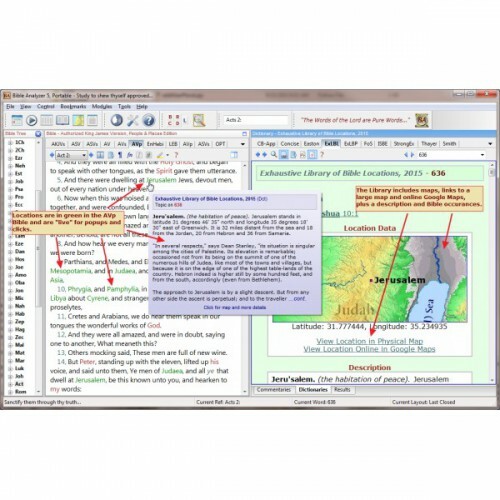 Each place in the Bible is marked with green color (while the people are still in burgandy color) and will display a popup preview of data about the location on mouseover. When clicked its page will be opened in the Exhaustive Library of Bible Locations where a map snippet can be viewed, other maps opened, and even the location viewed online with Google Maps! There are also two custom physical maps available in the Image Viewer that are used to display the relative location of each place, plus three maps that are hot linked to the town names so a popup preview can be viewed. The current AVp Edition Bible is tagged with both people and place IDs. People names or pronouns are in a burgandy color and place names are green. However, the libraries required to view data about each person or location are in seperate resources. The updated AVp Bible is distributed with both Libraries. If you already have the Exhaustive Library of Bible People, if you get theExhaustive Library of Bible Locations your AVp Bible will be updated to the most current version. 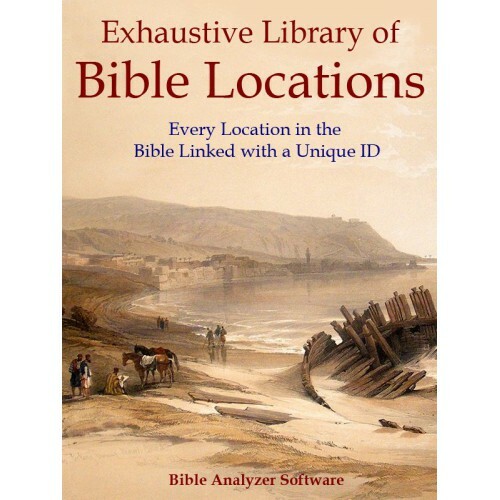 A large amount of work was required by several individuals to make this resource possible, and it could sell for $50 or more and still be a reasonable purchase, but our goal is to offer software as economically as possible, so we are going to offer the Exhaustive Library of Bible Locations with the updated Authorized Version People and Places Edition plus five custom maps for only $6. This is a remarkable price for such a resource. Others would charge much more if they had something like it to offer. But we want to make it available to as many believers as possible.